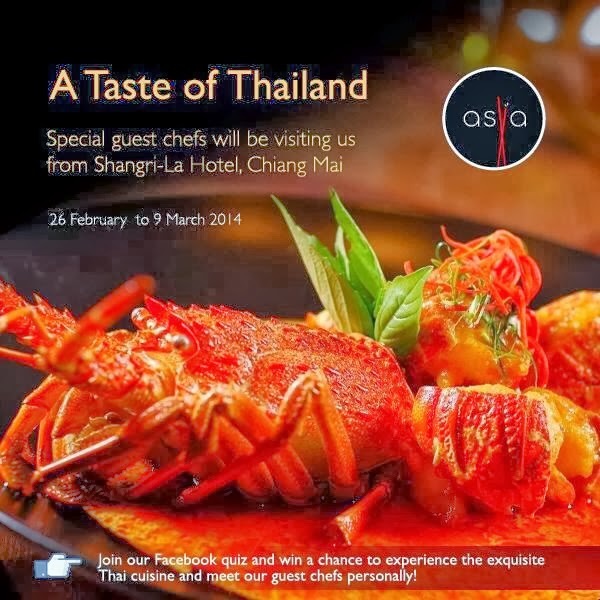 The Shangri-La starts its Thai food promotion today and runs until the 9th of March which is being prepared by two chefs from the luxury hotel chains Chiang Mai (Thailand.....) resort. The event takes place at the Asia restaurant in the Al Mazaar Souk and on offer are both an a la carte menu and set menu options too. I have an unrelated question. I understand the official religion in Oman is the Ibadhi form of Islam. My question relates to whether the city of Muscat has any Sunni Mosques? Well another post where you are promoting restaurants. Brilliant. Numerous bloggers raise the issue of contractors taking bribes but are then happy to take a free meal in return for publicising a hotel restaurant. To the anonymous commenter - you obviously have a problem with this blog, so why don't you do yourself a favour and just not read it anymore? This is my blog and my hobby. Helping to spread awareness about numerous events around town is what I primarily do. That might be a charity book sale, a treasure hunt, a new restaurant or restaurant promotion, or any number of such things I want to write about. In this case I've helped to spread awareness about a genuinely good food promotion because someone asked. I shared the event before I even attended the dinner, and you don't like that. But when I share a charity book sale, you're ok with that. How about when I share all the valentines day events I have found out about in town? You're ok with that. How about when I share that there's going to be an aerial aerobatics display held in town? Or that lot's of peoples Omantel internet isn't working? I write about what I want to write about. Because this is my blog. I'm not in the business of upsetting people intentionally, so I ask you politely, if you don't like it.... don't read it. I think that's fair isn't it? Your are absolutely Sythe! I love your blog, keeps me updated about things happening in muscat. cheers! I am a Thai food lover and unfortunately I missed this opportunity. Your post is much informative. Keep updating your site with information of various events. Choose one of your choices and enjoy your tour in a delightful and memorable way in this land of smiles, Thailand and treasure the most cherished moments of lifetime. http://eliburan.com/bangkok-ratchadamnoen-avenue/ The major attractions of the place being "islands" are picturesque nature blessed beauty.